From a Felluca (sailboat) at Aswan, Egypt. Great pic, the reflection of the building is a beautiful effect. Becky, thanks for your comments. I will crop the photo as suggested and send it to you personally. My favorite aspect of this photo is how you actually balanced the composition by contrasting the subject matter with the double sails in the shade on the right and the single tower in the soft sunlight on the left, all captured in the water's reflection. Nicely done! :-) I'm curious if the balance might be enhanced a little by cropping the photo on the left even closer to the building (which would make the image more of a square shape rather than rectangle) ... just a thought. Awesome shot! Love the comp and reflections! 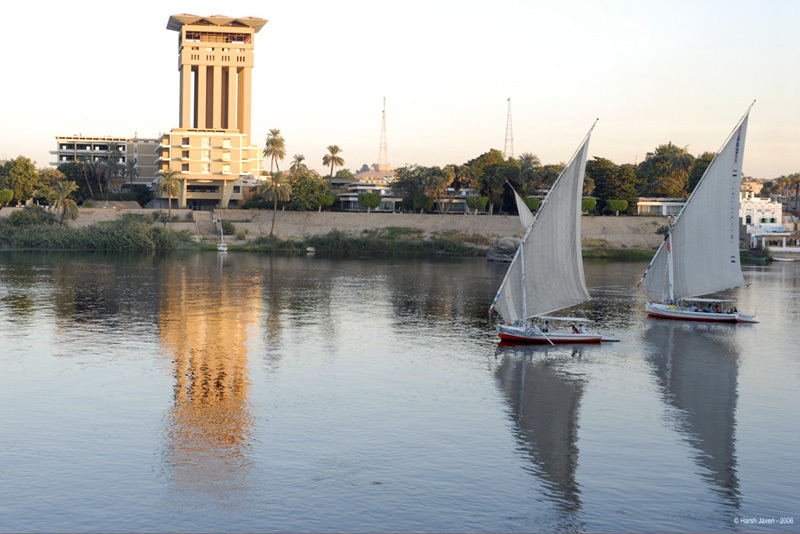 Aswan seems like a seren place! Great shot... can almost see cleopatra! What a lovely pic of a very lovely place!